Home > Discover our Light Weight Deflectometers at bauma 2016! Discover our Light Weight Deflectometers at bauma 2016! Do you need a Light Weight Deflectometer? Visit us at the BAUMA in Munich and see our Light Weight Deflectometer for the dynamic load plate test in action. The Light Weight Deflectometer from Terratest is being appreciated worldwide for an enormous quality standard. It’s the only device in the world with TÜV certificate and high-performance rechargeable battery for a convincing performance on the construction site. 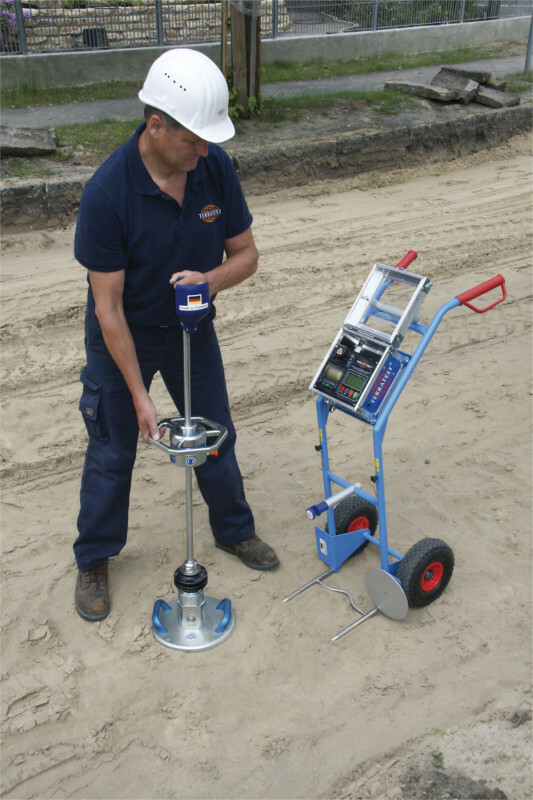 The device is being used for quality optimisation during compaction works in many different sectors, such as earthworks, civil engineering, road, track and pipe construction as well as gardening and landscaping for example. Find out about the foolproof operation and the extreme suitability for use on construction sites of our Light Weight Deflectometers made in GERMANY. We are looking forward to your visit and to talking to you personally. You will find our Light Weight Deflectometers in Hall B3, Booth 146, directly across from the giant excavator of the Frutiger company.